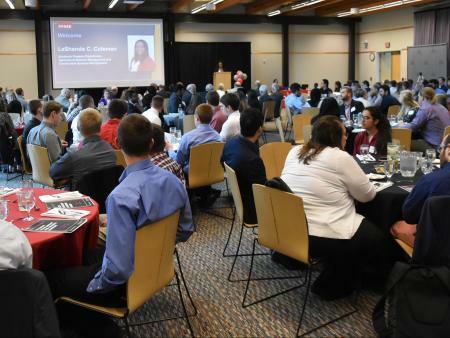 Earlier this week, faculty, staff, students, alumni, industry partners, and friends of FABE gathered to celebrate their achievements and another phenomenal academic year at the annual Department of Food, Agricultural and Biological Engineering Student Scholarship and Awards Banquet. The day began with seniors in agricultural systems management (ASM) and food, agricultural and biological engineering (FABE) presenting their Capstone Design posters. Seniors in ASM and FABE work on capstone projects all year beginning in the autumn. Projects are sponsored by industry partners from around the world seeking these student teams to help solve real problems. Following the presentations, the FABE banquet began. This year, the keynote speaker was Dean Cathann A. Kress, who shared words of wisdom with the audience and joined in the celebration of a great year of accomplishments. Dr. Scott Shearer, Professor and Chair of FABE reflected on a number of achievements made by faculty, staff, and students throughout the year before beginning the awards portion of the evening. In addition to annual awards, the Department of Food, Agricultural and Biological Engineering awarded over $100,000 in financial aid to over 60 undergraduate students and incoming freshmen for the 2018-2019 academic year.